From the Egg to the Table in 6 Weeks. 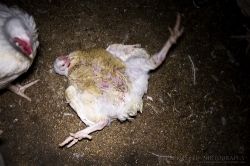 Chickens bred for human consumption (known in the industry as broilers) are housed in their thousands in huge sheds, that are not cleaned out for the entire chickens' short, approximately, 6 week lives. These birds are specially designed, by genetic modification, to grow large at a very rapid, unnatural rate. 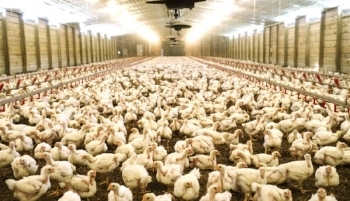 At "harvesting age," they are grabbed and crammed into crates, then into trucks, by their thousands, without regard for their fragility and sent off to slaughter.